With the rising food prices, especially in the urban areas, most urban dwellers are looking for various ways to prevent the lack of food. Due to the lack of ample gardening in the cities, urban agriculture is becoming increasingly popular. With the onset of high-rise buildings that provide shelter to many families, home buyers are looking for innovative ways to grow food. With the high demand for parking and recreation, there is little space for a kitchen garden. As such, substituting the current roof with an edible garden is a good idea. If you are planning to create a rooftop garden, safety should be your priority. Besides ensuring that the users do not fall off the roof, you have to make sure that the structure is structurally sound. When estimating the weight that your structure can support safely, you must consider the weight of the mature plants as well. When assessing the structural capacity of your building, the engineers recommend having a safety factor to cater for other issues, such as the wind, water, and containers. The best way to avoid the common pitfalls is to erect your containers on the load bearing structures. The columns provide the support you need to hold the containers, soil, and water tanks. In addition to the weight of the wet soil, you must think of the snow as well. While developing a planting scheme, you must remember that plants require the natural to grow properly. Before you invest in a rooftop garden, you must ensure that your roof receives adequate light for several hours during the day. The best approach is to print out the structural drawing and superimpose it on the architectural plan. Once you identify the positions of your columns, use a pen to highlight the best positions for your containers. If you have a large column, use it to support the water tank. When it comes to designing your planting beds, leave enough space for the paths. Decide whether you want to include some recreational areas in your scheme. If you have plenty of space, including a few recreational features will allow you to have your cake and eat it. Considering that soil can be extremely heavy when wet, you should not choose the planting media before you undertake your structural analysis. Ensure that you decide on the ideal planting media once the structural engineer gives your building a clean bill of health. Landscape architects recommend using the lightweight green roof soil that comes with 80% shale or and 20% organic material. If you make any changes to the original plan, you will have to include these elements in your structural design. Besides the weight, poses the problem of leakage in your roof garden. If the goal is to protect the slab, be sure to install a roof membrane. Whether you are using the containers or trays, ensure that you add a root barrier to give your membrane an extra layer of protection. Experts recommend separating the irrigation system from the storm water management system. While developing the irrigation system, you might connect a garden hose to a series of drip lines to avoid wastage. 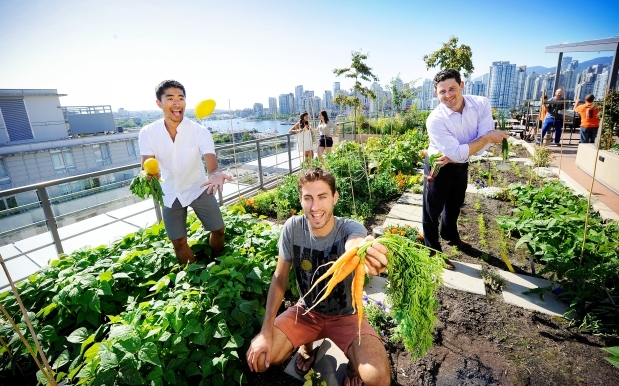 Since vegetables are light in weight, they are ideal for rooftop gardens. Most vegetables do not require huge containers or planting beds to grow properly. The common vegetables in most rooftop gardens include broccoli, melons, collards, spinach, and chard. Today, most homeowners are also including tomatoes, zucchini, and pepper in their planting schemes. If you want the garden to provide food for your family while adorning your property, you can incorporate a few flower pots too.